Habit: Root +- ellipsoid to diffuse-fibrous. Stem: base generally narrower than root, not firmly attached, +- glabrous. Leaf: generally on lower 1/3 of stem, +- glabrous; terminal lobe widest near middle. Inflorescence: pedicels 10--78 mm, generally > 10 mm apart. Flower: sepals reflexed, bright or dark blue. Fruit: 12--23 mm, +- curved. Seed: smooth, shiny, collar inflated. Stem: 25--80 cm. Leaf: basal, lower cauline generally divided < 80% to petiole; lobes 3--5, at least those of lower leaves generally > 15 mm wide. Inflorescence: pedicels generally glabrous. Flower: lateral sepal 11--17 mm, spur 10--18 mm; lower petal blades 5--8 mm. Citation for this treatment: Jason A. Koontz & Michael J. Warnock 2012, Delphinium patens subsp. hepaticoideum, in Jepson Flora Project (eds.) Jepson eFlora, http://ucjeps.berkeley.edu/eflora/eflora_display.php?tid=50111, accessed on April 19, 2019. 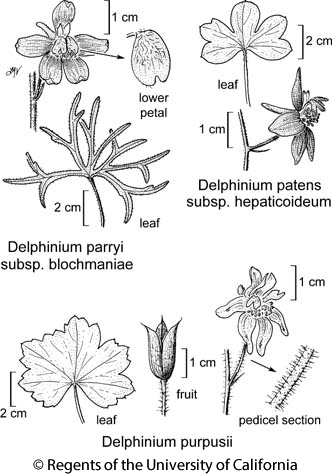 No expert verified images found for Delphinium patens subsp. hepaticoideum. SCoRO, SW (exc ChI). Markers link to CCH specimen records. Yellow markers indicate records that may provide evidence for eFlora range revision or may have georeferencing or identification issues. Purple markers indicate specimens collected from a garden, greenhouse, or other non-wild location.